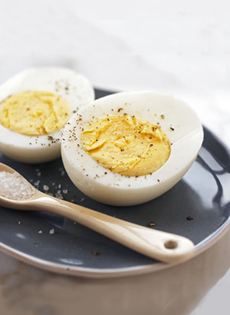 Hard-boiled vegetarian eggs. Photo courtesy American Egg Board. This is Page 4 of a four-page glossary of egg types and terms, including vegetarian eggs. Click on the black links below to visit other pages. Vegetarian eggs...vitamin-enhanced eggs and eggs enriched with omega-3 essential fatty acids. Welcome to the eggs of the 21st century. An organization whose producers voluntarily implement animal welfare standards that improve the care and handling of the hens. Their seal appears on the cartons of eggs produced under their standards. These eggs guarantee that the hens are only fed a vegetarian diet—free from meat or fish by-products. The hens are kept in cages and therefore cannot peck any grubs or worms. Vegetarian eggs are of importance to vegetarians, who do not eat any meat products. Omega-3 Eggs. Omega-3 fatty acids are primarily found in oily fish, and therefore, most people do not consume adequate levels of this beneficial fatty acid, which helps build cell membranes, are primarily components of brain, retina and other nerve tissue, and play a key role in the prevention and management of chronic diseases. Hens that produce omega-3 enhanced eggs are fed a special vegetarian diet that consists of canola, flaxseed and linseed—all rich in omega-3 essential fatty acids. A brown-shelled egg. Photo by Dirk De Kegel | SXC. The result is that they produce eggs with higher levels of omega-3 fatty acids than other types of eggs. Depending on how many eggs you eat daily, they may or may not meet your RDA for omega-3s, which can easily be consumed via capsule. They are more expensive because of the higher cost of the feed, and are just an alternative way to get these nutrients into your diet (you can take daily pills or eat salmon and other omega-3 enhanced foods like milk and yogurt). Vitamin-Enhanced Eggs. Similarly, hens are fed higher levels of vitamins such as B6, B12 and E, and lutein (which fights macular degeneration), which results in higher amounts of the vitamins in the egg. Like Omega-3 enriched eggs, these eggs are similarly more expensive, and are an indirect way to take these supplements. The yolk, the yellow center of the egg, comprises slightly more than one third of the egg by volume but contains three fourths of the calories, most of the minerals and vitamins and all the fat (which, as an animal fat, means cholesterol). The yolk also contains lecithin, the compound which enables emulsification in recipes such as hollandaise sauce and mayonnaise. The color of a yolk may vary depending on the hen’s feed, but color does not affect quality or nutritional content. 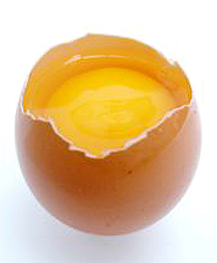 Egg yolks coagulate, turning firm and light yellow, at temperatures between 149ºF and 158ºF.